A massive X2.2 solar flare erupts off the left limb of the sun in this view captured by NASA's Solar Dynamics Observatory on June 10, 2014, at 7:41 a.m. EDT. The sun unleashed two major solar flares early Tuesday (June 10) in amazing back-to-back storms from our nearest star. The first flare, a powerful X2.2-class solar flare, hit its maximum at about 7:42 a.m. EDT (1142 GMT). The second powerful X1.5-class flare, followed quickly behind, blasting out from the sun at 8:36 a.m. EDT (1236 GMT). 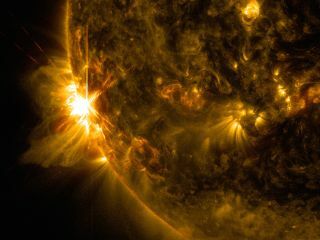 Both flares could cause radio communication blackouts on Earth for about an hour, according to an alert from the U.S. Space Weather Prediction Center in Boulder, Colorado. NASA's sun-observing Solar Dynamics Observatory captured a video of the flares from space.